The words free and Nest were ones that I never thought I would type in a single sentence. Well, in a surprising announcement (at least to me), Nest has announced a service called Sightline that provides free limited storage services to the Nest Cam and DropCam lines of home security cameras. Before getting into the specifics of this new feature, let me say that it’s very unusual for a company to add functionality to home security cameras that have been on the market for several years. Yet, that’s exactly what Nest has done. Nest has retroactively made Sightline available for DropCam cameras and they have been out for what I believe is three years. The Nest Cam has been out for at least a year. I appreciate a company that continues to enhance the capabilities of their existing product line. 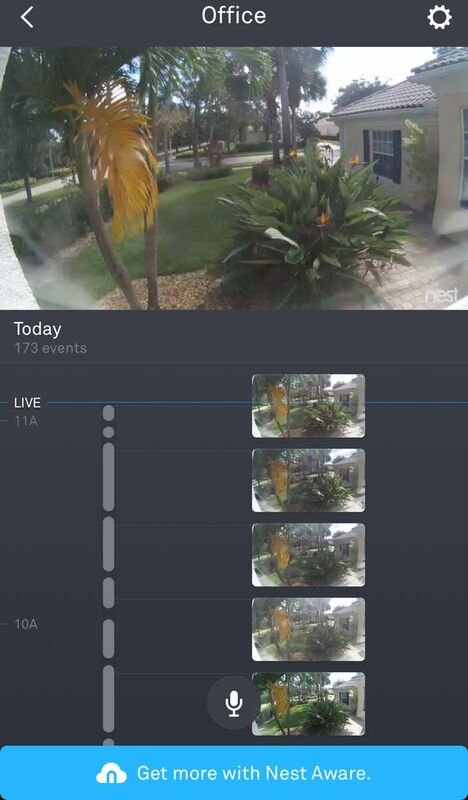 Snapshots of events are stored on your phone presumably from servers hosted by Nest. You can think of Sightline as a light version of their paid subscription which is called Nest Aware. Nest Aware Service starts at $99 annually and includes activated features on your camera plus extended retention of video. The free Sightline service saves images, not video. Each time a motion event is detected, an image is saved. This free enhancement retains the last three hours of images. After three hours, the retained images roll off your account never to be seen again. The image cannot be downloaded to a smartphone. However, like any smartphone image, you can do a screen capture. On an iPhone, that’s done by pressing the off button and home button simultaneously. The resulting image resides on your camera roll. A photo of what Sightline looks like accompanies this article. Select your desired camera video to get to Sightline. Effective with the September 8 update, it’s turned on by default. Scrolling down the timeline will allow viewing of every event that occurred in the past three hours. There is some intelligence built into this service however I still see snapshots being created by the movement of palm leaves. A passing car or human does set it off. That’s how you want it to work. If your camera is off, you can still see the past three hours worth of snapshots. It appears to me that you can only view these snapshots through a smartphone. I was unable to see these snapshots through my web browser. The free Sightline service is an important step forward by Nest in competing with many other home security cameras that provide a cloud service at no charge. I have been somewhat critical of Nest in charging their customers for the ability to see video history. There are a few notable drawbacks to Sightline. First, you only get to see a single image corresponding to the event and there is no video. Secondly, the marketing is over the top. You are consistently reminded that you can upgrade to their paid Nest Aware service at each scroll of the timeline. In addition, there is a sticky advertisement at the bottom reminding you of the ability to upgrade to Nest Aware. While it’s an important step forward, in my opinion, Sightline is somewhat lacking versus the competition. Sightline provides three hours worth of single images. Canary provides 12 hours of your video events at no charge. The Arlo Q offers seven days of cloud storage for free. The Logi Circle provides 24 hours of free cloud storage. So, in summary, Sightline is a good gesture but the free (and now included) service is somewhat behind their competition. The Nest Cam is a terrific piece of hardware with a great app. Just not so great on the free service. Don’t get me wrong, this free service adds to the usability of the camera, just not as much as what I think it should. Hopefully this is the initial version of the service and is something Nest will continue to enhance.